Glitter *and* a pair of red velvet curtains? The BBFC black card just got fabulous. The British Board of Film Classification (BBFC) has announced the winner of their centenary competition for kids. 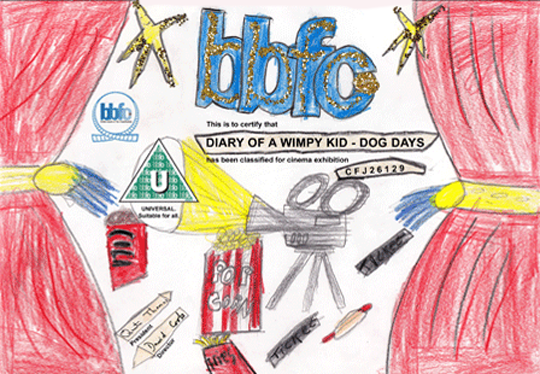 10 year old Jason Bangar from Birmingham will have his BBFC Black Card design shown ahead of every cinema screening of summer blockbuster Diary of a Wimpy Kid: Dog Days (U), which opens on 3 August. 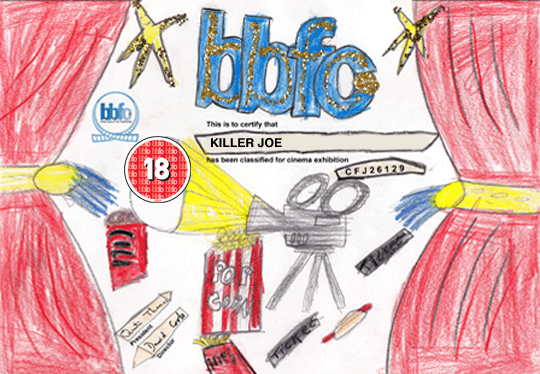 Jason entered a design after his teacher saw the competition advertised on the BBFC Children’s website CBBFC. The competition is part of the BBFC’s centenary celebrations, with all entries judged by BBFC Education Officer Lucy Brett and Demir Yavuz, Technical Manager at 20th Century Fox. Way to rain on the parade, guys.